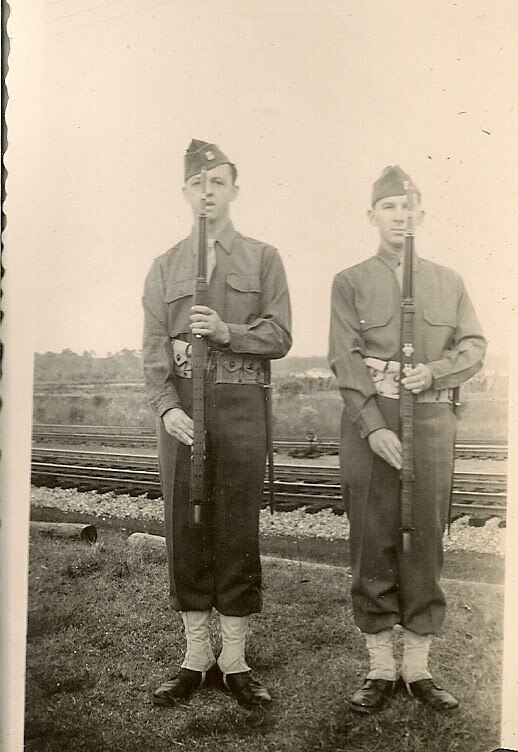 This past week, we received a package from one of my husband's cousins containing a photo album that his Uncle Gene kept during World War II. 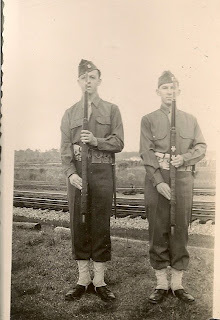 Uncle Gene was a quiet, unassuming, very gentle and kind man who enjoyed the simple pleasures of life. Never married, he loved his nieces and nephews and, especially, their children. The photos above are from the album. This past March we drove several hundred miles to celebrate his 87th birthday with him only to find, on March 15, the Ides of March, that he had passed away in his own home, waiting for our arrival. Almost the entire town of Jessup, PA showed up to support us as we entered his home to find him lying on the floor beside his bed since we had not been able to reach him by phone. The police came to help us, the volunteer firemen, and the neighbors -- there is nothing like the fellowship of small-town USA. 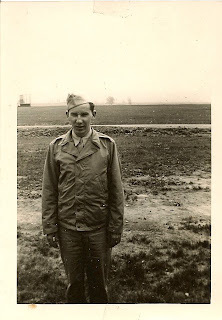 Like many men of his generation, by his 20th birthday, he was serving his country. 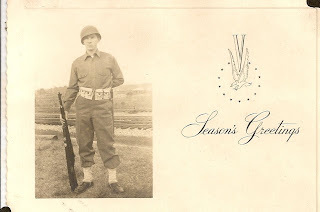 He was a Military Policeman (MP) and, during the Summer of 1944, he made several round trips (we presume by troop ship) to Europe to bring POWs back to the US. He left the military a changed man, but lived a productive and full life. Acting NSF Director -- Congratulations to Dr. Cora Marrett! Dr. Arden Bement is stepping down as Director of the National Science Foundation (NSF) six months short of serving his full term. He will be returning to Purdue University to head a new public policy institute according to the article in the ScienceInsider. Interestingly, according to a press release issued by the University of Wisconsin on May 28 (but I could find no press release yet from NSF), Dr. Cora Marrett has been named the Acting Director of NSF and will very shortly assume her new duties. According to the University of Wisconsin press release, Dr. Marrett's appointment was announced last Friday (May 28, 2010), interestingly, in a memo distributed to all NSF employees. Dr. Marrett, who has a long history as a top administrator with NSF, has been serving as acting deputy director of NSF since January of 2009. In the memo, Arden L. Bement Jr., the departing director of NSF, said the appointment was made after consultation with the White House about the status of the search for a new director for the agency. Dr. Cora Marrett is an emeritus professor of sociology at the University of Wisconsin Madison but she also served as the Provost at the University of Massachusetts Amherst in the mid to late 1990s. She was an outstanding Provost and, from, time to time, we still exchange communications. I have a collection of personal notes that she wrote to me as Provost, always recognizing and marking some achievement of the faculty. Her integrity, kindness, and intellect made her a favorite of the research faculty and she was much admired and very well-liked. Above I posted a photo of a dinner following my Distinguished Faculty Lecture at UMass Amherst - "Networks for Fun and Profits," that I delivered in April 2000. After the lecture, I received the Chancellor's Medal. 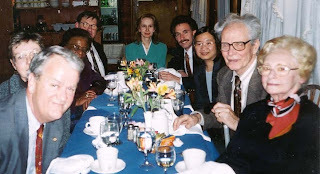 At the dinner, joining me (seated in the shadows in the back) were: Dr. Cora Marrett, who was seated next to my husband in glasses, Dean Tom O'Brien (our long-serving former Isenberg School of Management Dean) and his wife, Gena, who passed away last year, Dr. Val Haensel, the National Medal of Science winner and chemical engineering pioneer (who has since passed on) and his lovely wife, Herta, my former chairman, Dr. Nelson Lacey (with moustache), and my dear friend, Dr. Kei May Lau, who is now a Professor of Electrical Engineering at the Hong Kong University of Science and Technology. I wish Dr. Marrett all the very best in her new leadership role and congratulate her as our new Director of the National Science Foundation! The Deerfield Academy graduation that took place today in Deerfield, Massachusetts was stunning -- with glorious sunny weather, a mild breeze, and the happy graduates, their families, friends, and teachers, plus the rest of the school in attendance. Given all that is happening in the world, it is nice when there is good news and what could be better news than having students who have worked very hard reach another milestone -- that of their high school graduation. Now new adventures await them as they embark on their college careers but they will never forget the lessons learned, the challenges faced, and the eternal friendships made while at Deerfield Academy. Several of my colleagues' children have graduated from Deerfield and now my daughter is a student there, having graduated from The Bement School last year. An excellent education is one of the most important gifts that one can receive (besides good health) so I thank the teachers and the educational institutions that make the realization of dreams possible. I returned recently from speaking at a workshop in Honolulu, Hawaii, where I heard from many locals of their outright physical pain and disgust at the growing oil spill from the Deepwater Horizon rig blowout in the Gulf of Mexico. I have refrained from writing about this disaster, with the explosion dating to April 20, 2010, until now, since, as many, I was hoping that, perhaps, the "top kill" approach might work to block the massive flow of oil spilling from this deepwater rig. It has not worked, which is another very serious setback. Elisabeth Rosenthal writes in The New York Times, that already half a decade ago, David Eyton, who was then BP's Vice President for deepwater development in the Gulf, noted that: IF we’ve learned anything so far about the deepwater Gulf of Mexico, it is that it contains surprises. And that means an operator needs depth — depth in terms of resources and expertise — to create the capability to respond to the unexpected. As a professor at the Isenberg School of Management, who is in the Department of Finance and Operations Management, it is clear to me that there was insufficient risk assessment conducted prior to this drilling endeavor. The potential benefits (think profits) were weighted more highly than any potential costs, including risks; not to even mention the potential adverse environmental impacts. Companies must recognize the importance of corporate social responsibility and the negative externalities of their actions on citizens, on nature and the environment, and on a sustainable way of life. Ways of life of those who have labored hard and long, including the fishermen, in areas so adversely affected are being transformed for the foreseeable future. The anger and frustration are felt by us all. The design of our supply chain networks so that environmental and risk issues are explicitly incorporated is essential. We, as faculty and students in business schools, need to collaborate across boundaries (disciplinary and professional ones) to provide tools that can assess the potential impacts of corporate actions. In a week, the ALIO-INFORMS conference begins in Buenos Aires, Argentina. One of the talks that I will be presenting there is entitled: "Sustainable Supply Chain Network Design: A Multicriteria Perspective." The presentation has now been posted and is available for download (in pdf format). This talk is based on the paper, with the same title, which is now in press in the journal, The International Journal of Sustainable Engineering. The paper captures, in a quantifiable way, multicriteria decision-making in supply chain design, which includes, for example, environmental impacts associated with different technologies. As for other ways, in addition to solid research, that business school students and faculty can help with regards to this environmental and economic disaster, although we may be physically thousands of miles away, read this blog post. It is clear that worse-case analysis was not addressed in the planning and construction of this deepwater oil rig in the Gulf of Mexico. The Radcliffe Institute for Advanced Study announced its 2010-2011 Fellows today. There are 48 Fellows who will be working on their projects at the Radcliffe Institute at Harvard University. The projects that I find of particular interest are the one of Susan Landau, who is a distinguished engineer with Sun Microsystems, and who will be working on aspects of cybersecurity, and the one of Joanna Aizenberg, a professor at Harvard and Radcliffe, who will be part of a cluster in bioengineering, applied math, and mathematical biology, working in biomemetics. I am sure that all the new Radcliffe Fellows, whether from the humanities, creative arts, social sciences, or the sciences, will have an extraordinary year filled with exciting talks, wonderful conversations, new friendships, and new collaborations (on top of their own projects). The Radcliffe Institute is located close to Harvard Square in Cambridge, MA, an intellectual and lively mecca. My Radcliffe Fellowship year was 2005-2006 and I wrote about this incredible year in an essay that can be found on the Radcliffe Institute website (a version of it also was published in ORMS Today, the magazine of the professional society INFORMS). Elaine Chew, whose professional field (in addition to music) also includes operations research, was a Radcliffe Fellow in 2007-2008. I wish that more individuals who work in operations research, management science, as well as in engineering, who conduct interdisciplinary research and who would flourish in the unique environment that is Radcliffe, would apply for this fellowship. Although there is a lot of competition to secure one, nothing ventured -- nothing gained. Speaking of the Radcliffe Institute (which was formerly known as the Bunting Institute and became the Radcliffe Institute a decade ago), Gloria Steinem, the feminist activist, will be receiving the 2010 Radcliffe Institute Medal in ceremonies associated with Radcliffe Day tomorrow. I was planning on attending Radcliffe Day, since it also serves as a reunion day for Radcliffe Fellows and for graduates of Radcliffe College (which merged with Harvard University) but due to an upcoming international trip will not be able to. I congratulate the 2010-2011 Radcliffe Institute Fellows and wish them all much success with their projects! One never knows the experiences that await nor the interesting people one might meet while traveling. As an academic, the majority of my travel entails speaking engagements, whether at workshops or conferences, or in seminar settings. I also do my fair share of travel to serve on panels, including government panels, and give short courses. My most recent trip, which I have written several posts on, was to Honolulu, Hawaii, to speak at the Workshop on Social Theory and Social Computing. The workshop organizer, Dr. Sun-ki Chai, who is a Professor of Sociology at the University of Hawaii, told me at the workshop banquet at a Korean restaurant in Honolulu, that he was a classmate of President Obama's at the Punahou School and that they both graduated together as the class of 1979 (interestingly, they were also classmates earlier in their elementary school). How often does one meet an academic colleague who can say that he went to school and graduated with the President of the US?! Obama went on to Occidental College, and then transfered to Columbia University; afterwards he received his law degree from Harvard. Dr. Sun-ki Chai, on the other hand, went on to Stanford, where he received 3 degrees, in Mathematical Sciences (a Bachelor's), Computer Science (a Master's), and in Political Science (the PhD). The Punahou School, which goes from grades K-12, is the largest independent, co-educational school in the US. Given the kind of intellectual leaders that it has graduated, it deserves a round of applause. The above photos were taken this past weekend at the Social Theory and Social Computing Workshop in Honolulu, Hawaii. The workshop brought together researchers and a few practitioners from complementary fields, ranging from computer science and operations research / management science to economics, sociology, and political science, who are interested in social processes and the underlying dynamics. The venue was the Hyatt Waikiki hotel. I also had a chance to attend the workshop banquet at a neighboring Korean restaurant, which was terrific. Most of the presenters' talk slides have been posted, along with additional photos, on the workshop website and can be found here. 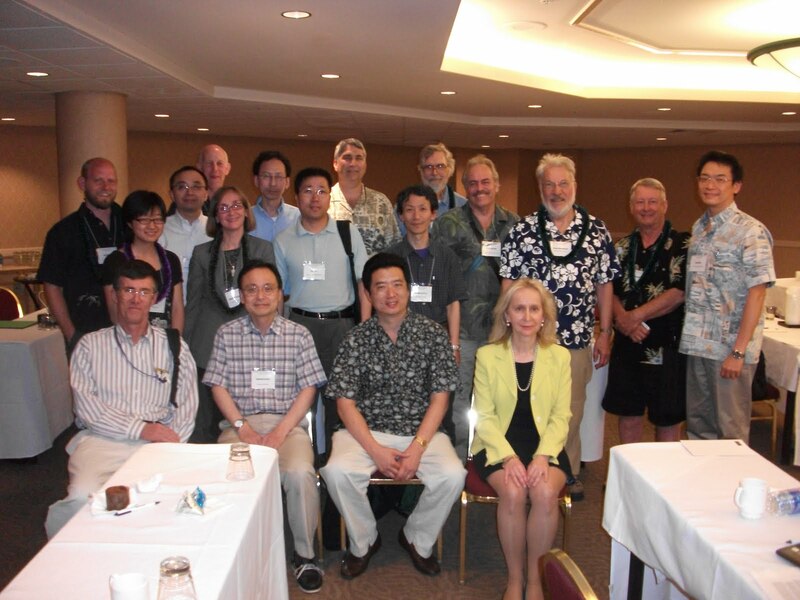 This workshop was sponsored by the Air Force Office of Scientific Research (AFOSR) and both the funding agency and Dr. Terry Lyons, who was the cognizant program officer, along with the University of Hawaii workshop organizer, Dr. Sun-ki Chai, should be commended for the excellence of the speakers and the discussions. I am back from the Social Theory and Social Computing Workshop that took place in Honolulu, Hawaii, May 22-23, 2010. Above I share some scenes of the Waikiki Beach area taken during some spare moments during my all too brief stay in a location that has been called paradise. As for my flight back from Honolulu to Chicago (on the red-eye Flight 2 on United) it was nowhere as wonderful as my flight over on Flight 1 that I wrote about in an earlier post since my seatmate brought a cat on board and did not notify the airline. The mewing sounded especially painful as we were landing and throughout the flight I was wondering why he kept on coughing, sneezing, and wheezing to such an extent that I spent a lot of time in the back talking with fellow passengers. The Workshop on Social Computing, which took place May 22-23, 2010 in Honolulu, Hawaii is now over and it was a great success. It takes a lot of intellectual confidence, creativity, and, may I say, guts, to organize a truly interdisciplinary workshop which brings scholars and researchers from disparate fields. Dr. Sun-ki Chai, of the University of Hawaii, deserves congratulations and thanks for his extraordinary efforts in pulling off such an exciting workshop in such an extraordinarily beautiful location! This workshop brought together social scientists (sociologists, political scientists, economists, communications experts) with computer scientists, engineers, and an applied mathematician/operations researcher/computational economist/network scientist (me). I had an outstanding time intellectually as well as socially. It was a privilege to listen to some of the pioneers in the area of social computing who are breaking boundaries of different disciplines. My presentation was on: Network Design: From the Physical World to Virtual Worlds and it can be found here. I enjoyed the presentations as well as the discussions immensely. Yesterday, I was on flight 1 from Chicago to Honolulu and this United flight was wonderful. It was very cool to be on Flight 1 and I could not have asked for a nicer seatmate -- an army reservist, named DJ, who, after training, was being deployed to Honolulu. We talked for a long time about military training, operations, and logistics. He will hear in a month whether he goes to Afghanistan or stays in Honolulu for two years. This young man, age 20, had such entertaining stories to share about his basic and specialized training that the flight of over 8 hours passed by quickly. The United staff was fantastic and allowed us to stand for quite a while. They were courteous and friendly and even told me of sights in Honolulu that I should see. Although with the workshop I do not have spare time for sightseeing. There were quite a few military members on our flight since Hawaii's main industries are now tourism and the military base. As we were landing we clapped for the military present as well as for the veterans. As for Honolulu, the workshop is at a hotel on Waikiki beach and the views and shops are simply magnificent. I have been taking long walks early in the morning and my hotel room has a balcony with a view of the Pacific Ocean. It is a location filled with beauty. I am very much enjoying the workshop, which is funded by the Air Force and it is multidisciplinary with fascinating perspectives. I like to be in such an intellectually challenging environment. I gave my presentation today and very much enjoyed the experience. An earlier blogpost has information about my talk and the workshop program. Did you know that buildings consume 70% of the electricity used in the US? Although there has been clear progress in terms of making appliances more efficient, an enormous amount of energy is still wasted in buildings. Equipment may be left operating when it is not needed, air conditioners may be running full blast where there are no occupants, and mechanical and electrical infrastructure may become less efficient over time. When one considers how much time humans spend in buildings it is imperative that research into sustainable buildings receives full consideration and support. Alec Appelbaum has an excellent Op-Ed piece in The New York Times, "Don't LEED Us Astray." LEED, which stands for Leadership in Energy and Environmental Design, is a program which awards points for incorporating eco-friendly material and practices into buildings' design and construction. It has brought great attention to environmental awareness from the buildings and construction sector, as well as from consumers. The United States Green Building Council gives out the LEED certification, with the highest level being "platinum," and such certification has now become the most-widely used green building measure in the US. Appelbaum, in his article, notes that much more should and could be done regarding the LEED certifications, since they provide a snapshot of a building at a point in time. According to Appelbaum, and I concur: some certified buildings end up using much more energy than the evaluators predicted, because the buildings are more popular than expected or busy at different times than developers forecast, or because tenants ignore or misuse green features. The government should institute regular audits or "check-ups" to ensure that the certified buildings are performing energy-wise, as certified. Those who perform well may get tax credits or even subsidies for outstanding performance. I would argue that one needs to capture the entire life cycle of the building (clearly a challenging research and practical problem, but manageable). In order to do this, we need to develop green building supply chain design models. 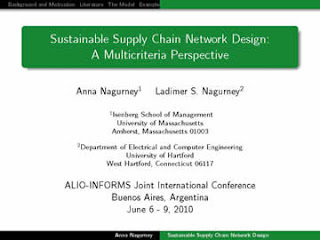 We have, recently, taken a step in this direction with our study, "Sustainable Supply Chain Network Design: A Multicriteria Perspective," which is forthcoming in the International Journal of Sustainable Engineering. Given how much time people spend in buildings and, hence, how important buildings are to our health and well-being, and that of the environment, we, as a nation, need to push the frontiers of energy research in this direction. USAToday.com is reporting that high tech mergers, both in number and in value, are on the increase. Especially attractive, as acquisitions, are firms associated with mobile computing, cloud computing, and search engines. In the past year, SAP, IBM, Apple, and Google have acquired firms and Oracle's success may be due, in part, to its earlier wise acquisitions. Interestingly, the article also notes that the Chinese are eager to acquire firms. One of the major drivers in mergers and acquisitions (M&A) this time around is the desire to obtain access to new global markets, coupled with bigger firms acquiring smaller, agile firms with technological know-how and cutting-edge technological expertise and products. Moreover, many of the leading high tech companies are sitting on a lot of cash and interest rates are lower than a year ago signaling an improved economic climate for such transactions. Our research on the integration of multiproduct firms, and the quantification of associated synergy, entitled,"Multiproduct Supply Chain Horizontal Network Integration: Models, Theory, and Computational Results," was just published in the International Journal of Operational Research, volume 17 (2010), pp 333-349. The results therein can be applied to assess the synergy of mergers and acquisitions of firms with similar or distinct portfolios of products and with access to different markets. Another recent M&A study of ours, which is in press, also in a peer-reviewed journal, Computational Management Science, entitled, "Formulation and Analysis of Horizontal Mergers Among Oligopolistic Firms with Insights into the Merger Paradox: A Supply Chain Network Perspective," shows the impacts on profits of different acquisitions in industries in which the firms compete directly and feed the same markets. I am getting ready for the Workshop on Social Theory and Social Computing: Steps to Integration, which takes place next weekend in Honolulu, Hawaii. This workshop is sponsored by the Air Force Office of Scientific Research (AFOSR) and is the brainchild of Dr. Sun-Ki Chai of the University of Hawaii. The rise of the internet, both as a platform for social action and a rich source of social data, has turned computer science's focus increasingly to measuring, analyzing, and predicting social phenomena. However, the level of engagement between this work and the body of existing social science work leaves much to desired. While certain social science methodologies and formalisms have been adopted widely, social networks being by far the most notable, more disconnect is more generally noticeable than dialog and integration. By bringing together a group of prominent social scientists (themselves from different disciplines), computer scientists, and engineers who are studying similar kinds of social phenomena but generally do not move in the same academic circles, we hope to kick-start this interchange of ideas and to promote further interdisciplinary collaboration. I am so honored to be an invited speaker at this workshop and am so looking forward to the presentations and intellectual exchanges. My presentation is on: "Network Design -- From the Physical World to Virtual Worlds." Abstract: In this talk, I will present recent research on the design of networks from different perspectives (centralized/cooperative vs. decentralized/competitive). The approach is sufficiently general to capture the network designer's multicriteria-decision-making behavior. I will illustrate how this theoretical and computational framework can be applied to physical networks, ranging from transportation to telecommunication ones, as well as to logistical ones (including supply chains). I will also discuss issues of redesign, as well as network integration, with applications as varied as corporate mergers and acquisitions and humanitarian logistics operations. I will then overview how networks such as social and knowledge ones can also be subject to network design (and even be integrated with physical networks) and discuss the unique challenges of network design in virtual worlds. I have only been in Hawaii while being processed at the airport en route to/from Australia. Although I will be spending most of the time indoors at the workshop I hope to somehow absorb this state's beauty. David Carr has a thought-provoking, entertaining article in The New York Times about headlines that search engine optimization (S.E.O.) seems to favor. In the article, he has some provocative headlines and some background as to how the new media seeks to capture readers' attention and how headlines of Internet stories move to the top of searches, which are the results of computer algorithms (something we as operations researchers or computer scientists know a lot about). Some dumbing down of Internet article headlines is inevitable, since short, punchy, catchy phrases appear to "attract" the search engines' "attention," as do names of celebrities and those in power or whoever is "the flavor du jour." As David Carr muses: it leads to a sameness that can make all the information seem as if it were generated by the same traffic-loving robot. We are living in an era of short-term gain, in which the creation of works that will last, be they in scholarship, science, literature, art, music, etc., are not as well-recognized (the same goes for the sustained effort required of such creations). To construct works of lasting value one needs persistent, consistent labor over time, and a deep focus and attention span. But, then again, many of the greats did not get their recognized due until they were long gone. Their rewards came from their internal need and drive to innovate and to use their imagination in novel ways. In my earlier blogpost I wrote about the excitement surrounding college graduations. Above I share some photos taken at the Isenberg School of Management graduation, which took place today. The event was fabulous. It was so special to shake the graduates' hands and there were numerous hugs. Faculty members from each departmental major congratulated the respective graduates. I shook the Operations Management majors' hands. This Isenberg graduating class of about 1,000 represents 23% of the undergraduates who graduated from UMass Amherst this year, which is quite impressive. As impressive is the quality of the students and how wonderful they are. It will be hard to top such a tremendous group of students. You can read more about the general undergraduate commencement that took place at UMass Amherst today here and read Sheila Bair's remarks here. Sheila Bair is the Chairwoman of the FDIC and was the commencement speaker today. This time of year is when many college graduations and associated events and festivities take place. Yesterday, UMass Amherst awarded graduate degrees at the Mullins Center and we had a nice group from the Isenberg School officially receiving their PhD degrees. Today, on a simply gorgeous spring day, undergraduate degrees will be awarded at a joint campus event, which will be followed by individual school events, including one at the Isenberg School of Management. I am looking forward to seeing my Operations Management students graduate! They have all worked very hard and have had the advantage of a challenging curriculum with great professors. Our students are a delight to teach. The undergraduate commencement speaker will be Sheila Bair, the Chairwoman of the FDIC, who is officially on leave from my department (Finance and Operations Management at the Isenberg School of Management), where she had a faculty appointment for a few years. UMass Amherst issued a nice press release on her being back to speak at commencement. She, along with Mary Schapiro and Elizabeth Warren, are featured on the latest cover of Time Magazine, with an accompanying article, The New Sheriffs of Wall Street. In the article, former Senator Bob Dole, who was her mentor, is quoted as saying that Sheila "was available 24/7." In addition, he is quoted as saying: As my wife will tell you, more is expected of women. Dole, in 1990, encouraged Sheila to run for an open House seat in Kansas. She ran as a pro-choice Republican and lost narrowly. Senator Dole told me the reason I lost was because I was a woman and I was unmarried, Bair recalled last year, on accepting the Profiles in Courage Award at Harvard University. That made me all the more determined to take on new challenges. Sheila is now married and has two children, including an adopted daughter. She still very much enjoys coming back to Amherst (which, I must say is primarily Democratic). I agree with Dole's statement that, more is expected of women; nevertheless, we can still be major instruments of change, whether through government, scientific research and discoveries, business, engineering, medicine and healthcare, creative arts, media, and/or education, or, however, we and our family members and students, decide to fly on our own wings. So, congratulations to all of this year's college graduates! The NetSci2010 conference, at the Media Lab at MIT, which took place May 12-14, 2010, was a very enjoyable experience for several reasons. I had the opportunity to take one of my doctoral students, Min Yu, to her first professional conference in the US. The paper that I presented, "Supply Chain Network Design for Critical Needs with Outsourcing," was based on our joint work with Dr. Patrick Qiang, and it had been, just this past week, accepted for publication in Papers in Regional Science. It was refreshing to see her excitement and enjoyment of the talks and her enjoyment in meeting various speakers. What really pleased me a lot was that we had, over the past several years, hosted several of the organizers and invited speakers in our Speaker Series in Operations Research / Management Sciences at UMass Amherst. It was terrific to see, once again, Professor Barabasi, Professor Alex "Sandy" Pentland, Professor Asu Ozdaglar, and, albeit, just briefly, Professor David Lazer. The talks were wide-ranging (from mobile phones, to the diffusion of ideas via Facebook, to supply markets and financial markets and volatility, to honest signals, organizations, and productivity, among others) and there was an appreciation for discussions. Also, there were poster sessions. We even met a few members of the operations research community. Quite a few of the talks were on data-driven topics, whereas our talk focused on optimization and network design, and redesign with an emphasis on critical needs products, such as vaccines, medicines, and food and water supplies for humanitarian operations in the case of disasters. We were delighted to come across Professor Rae Zimmerman of NYU, who works on network vulnerability, climate science, and cybersecurity at the conference and got a chance to reflect with her even on regional science. We also spoke with Professor Satish Ukkusuri of Purdue University. Given the contributions to networks from the operations research community going back to the 1940s, it is important that that scientific literature, whose applications have impacted transportation, telecommunications, finance, and even supply chains, both in theory and practice, be represented, in the newer "network science" literature. 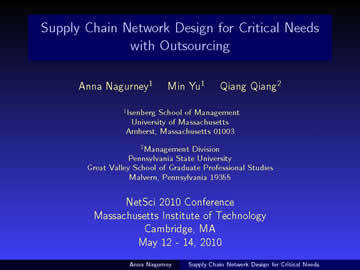 I will be at MIT for the NetSci2010 Conference over the next couple of days and will be presenting the paper, "Supply Chain Network Design for Critical Needs with Outsourcing." The paper has been accepted for publication in the journal, Papers in Regional Science. The presentation may be downloaded here. I will be going with one of my doctoral students, Min Yu, who is a co-author with me of the paper, along with Dr. Qiang "Patrick" Qiang. The conference should be very interesting and the venue of the Media Lab should be perfect. I am looking forward to seeing many colleagues there. The end of the academic year is always filled with numerous celebrations-- from parties to banquets to graduations. It is a time to revel in our students' accomplishments and the achievement of their goals. This past week, we hosted an end of the semester party, which coincided (unplanned) with a huge wind and rain storm, which knocked down trees (but, luckily, the Isenberg School of Management, which was the indoor site for our party did not lose power). The party was hosted by the UMass Amherst INFORMS Student Chapter. The party featured international cuisines from Turkey, Ukraine, China, Japan, the US, Iran, and other countries, and, amazingly, the food tasted really good together! At the party, I had the chance to recognize the outstanding chapter officers for their excellent service throughout the year, which includes hosting our terrific Speaker Series in Operations Research / Management Sciences. Attendance at the party was great with students, both undergrad and graduate ones, coming not only from the Isenberg School but also from Computer Science and Engineering (and they marched through the storm to get there). Faculty also came out to support the students and to celebrate the end of classes. Today is Mother's Day and I can't say enough about our wonderful students -- they show up when it matters, work very hard together with terrific esprit de corps, and the friendships continue after they graduate. Plus, our students are very entrepreneurial. For example, during the party, I spoke with one of the undergrads, who was born in Kenya, but is of Polish and Swiss descent. One of his majors is Operations Management. I asked him what he was doing this summer. He told me that he, with several others, was able to obtain funding from the Bill Clinton Foundation, so Africa Goal is on! This is truly an amazing initiative, which will bring viewing of World Cup soccer games to villagers in eastern Africa, combined with AIDS and HIV awareness education. You may find out more about Africa Goal here and even view the route that the group will take, combining the love of sports with health education! I am back from serving on a multidisciplinary proposal review panel, which was intellectually and professionally very rewarding and enjoyable. In my "free" time and since one can only sit so long, I enjoyed walking around neighboring Georgetown. The above photos were taken during my explorations. I had some company sampling some of the delicious cookies at Dean and Deluca in Georgetown. Some of the cakes and other goodies featured in the photos above would make scrumptious Mother's Day treats. I also came across the Ukrainian embassy in Georgetown with the flag flying proudly. Since Ukrainian is my first language, I could not resist taking a photo of the flag. Earlier, I wrote in this blog, that the cosmologist, Dr. Stephen Hawking, will be a headliner at the 2010 World Science Festival (WSF), which takes place in NYC June 2-6. The full lineup of 2010 World Science Festival speakers and commentators has now been officially announced. You may find the list of events and additional information here. This festival is definitely multidisciplinary and it is an extraordinary experience. I wrote about my impressions of it last year, since I was a panelist on Traffic at the 2009 WSF. One of the events at this year's WSF that especially intrigues me is the one on music with Marvin Minsky of Media Lab at MIT, who is considered the founder of artificial intelligence, and Tod Machover, the composer. Marvin Minsky's daughter is a neighbor of mine in Amherst and, coincidentally, next week I will be at the Media Lab at MIT to speak at the NetSci2010 conference. I would like to thank Brian Greene and Tracy Day, the organizers of the WSF, for putting together the 3rd WSF and wish everyone who is taking part in it this year a magnificent experience. We are pleased to announce that the paper, Sustainable Supply Chain Network Design: A Multicriteria Perspective, has been accepted for publication in the International Journal of Sustainable Engineering. The paper is based on research conducted by Professors Anna Nagurney and Ladimer S. Nagurney. Supply chain networks provide the infrastructure for the production, storage, and distribution of products as varied as pharmaceuticals, vehicles, computers, food products, furniture, and clothing, throughout the globe. Hence, the design of supply chain networks is a topic of engineering importance since it involves the determination of both the sites and the levels of operation of the relevant facilities that enable the manufacture, storage, and delivery of products to the consumers. Sustainability of supply chains has emerged as a major theme in both research and practice since the impacts of climate change have made both producers and consumers more cognizant of their decision-making and how their decisions affect the environment. In this paper, we developed a rigorous modeling and analytical framework for the design of sustainable supply chain networks. We considered a firm that is engaged in determining the capacities of its various supply chain activities, that is, the manufacturing, storage, and distribution of the product to the demand locations. The firm is faced with both capital costs associated with constructing the link capacities as well as the links' operational costs. Moreover, the firm is aware of the emissions generated associated with the alternative manufacturing plants, storage facilities, and modes of transportation/shipment, which may have different levels of emissions due, for example, to distinct technologies of, respectively, production, storage, and transportation. The firm is assumed to be a multicriteria decision-maker who seeks to not only minimize the total costs associated with design/construction and operation, but also to minimize the emissions generated, with an appropriate weight, which reflects the price of the emissions, associated with the various supply chain network activities. We provided both the network optimization modeling framework and an algorithm, which was then applied to compute solutions to a spectrum of numerical sustainable supply chain design examples in order to illustrate our approach. The paper may be accessed here. The NetSci2010 Conference will be taking place next week at the Media Lab at MIT, which is a gorgeous venue. 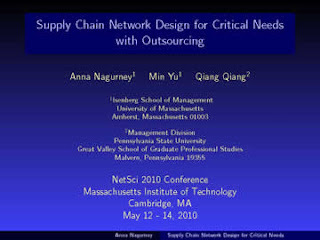 I will be delivering the paper: Supply Chain Network Design for Critical Needs with Outsourcing, which is joint work with Dr. Patrick Qiang and my doctoral student, Min Yu. Abstract: In this paper we consider the design of supply chain networks in the case of critical needs as may occur, for example, in disasters, emergencies, pending epidemics, and attacks affecting national security. By "critical needs" we mean products that are essential to the survival of the population, which can include, for example, vaccines, medicine, food, water, etc., depending upon the particular application. "Critical" implies that the demand for the product should be met as nearly as possible since otherwise there may be additional loss of life. The model that we develop captures a single organization, such as the government or a major health organization or corporation that seeks to "produce" the product at several possible manufacturing plants, have it stored, if need be, and distributed to the demand points. We assume that the organization is aware of the total costs associated with the various operational supply chain network activities, knows the existing capacities of the links, and is interested in identifying the additional capacity outlays, the production amounts, and shipment values so that the demand is satisfied with associated penalties if the demand is not met (as well as penalties with oversupply, which are expected to be lower). In addition, the organization has the option of outsourcing the production/storage/delivery of the critical product at a fixed/negotiated price and with the capacities of those entities being fixed and known. The solution of the model provides the optimal capacity enhancements and volumes of product flows so as to minimize the total cost, which we assume to be a generalized cost, and can include time, subject to the demands being satisfied, as nearly as possible, under demand uncertainty. Today, May 4, 2010, The Boston Globe is reporting that the water is now safe to drink in Boston and previously affected towns by the water pipe rupture. The critical pipe has been repaired that channeled fresh water to Boston and surrounding towns east of Weston, Massachusetts. However, tests still need to be conducted to ensure that the water that is coming through is clean and safe to drink. President Obama has declared a state of emergency in Massachusetts. Students at the colleges in Boston are coping as best as they can, but with the heat, and this period being final exam period for many colleges and universities, it is not easy. Besides the dirty dishes that are piling up, many are going without showers and without their coffee. The Boston Globe has an update on how students are trying to cope. All those affected will be appreciating and never again taking for granted fresh, clean water. A single water pipe rupture in Weston, MA has affected the availability of water for 2 million in the Boston area. Ironically, this huge pipe is less than a decade old. There is speculation that the cause of the failure was in the rubber sleeves. Boston receives its water from the Quabbin reservoir, which is located not far from Amherst, in western Massachusetts. The Quabbin was formed decades ago by destroying homes and relocating people. Cambridge has its own water supply and was not affected. The Boston Globe has a report on this catastrophic failure in which the loss of a single critical network link is affecting millions. People in the affected towns (east of Weston) are required to boil the water that they consume for a minute. There is backup water for bathing and flushing toilets (but not for drinking). The planners and engineers were concerned that such a failure might happen but could not construct a redundant link in time (it is scheduled to be completed in 2014). According to the Globe: “You always need redundancy,’’ said Joe Favaloro, executive director of the MWRA advisory board, which advocates for ratepayers. He said it was unclear how bad the problem is, and what costs would eventually fall to ratepayers. Also, according to the Globe: Water authority spokeswoman Ria Convery said that the authority, working with the Boston Water and Sewer Commission, was able to reconfigure the water pipe lines in the Longwood Medical Area. That temporary fix allowed four major hospitals in the area — Children’s Hospital, the Dana-Farber Cancer Institute, Beth Israel Deaconess Medical Center, and Brigham and Women’s Hospital — to go about business as usual, without having to resort to bottled water. These are premier medical institutions and, thank goodness, there is clean water for the patients and staff members there. A colleague (and former doctoral student of mine), who is now a Visiting Scholar at UMass Amherst, and is a tenured faculty member at the University of Sydney in Australia, is spending this weekend in Boston. His wife arrived from Sydney at Logan this past Friday and since they had not seen each other since he began his sabbatical two months ago at the Isenberg School, they are spending this weekend in Boston. The weather has been glorious but without clean tap water, the store shelves have been emptied of bottled water and one has to be very careful about what one is drinking (and eating, frankly). I do hope, for everyone's sake, that this huge problem is corrected as quickly and as thoroughly as possible. The themes of the Fragile Networks book that I co-authored with Patrick Qiang continue to make the news on a (much too) regular basis. The surprise gift and Thank You card were left in my office mailbox. These unexpected acknowledgments that I received yesterday came from an excellent, and very hard-working, undergraduate student that had taken my Transportation & Logistics class last semester. She is majoring in Operations Management and will be graduating later this month from the Isenberg School of Management at UMass Amherst. I have enjoyed the conversations that we shared very much. The kindness and thoughtfulness of this student filled me with a very special warmth. Professor Nagurney, You are one of the very few women role models that I have had in my life. You are very motivated and successful and inspire me. Thank you for giving me the opportunity to be your student. I got the job as a *********** and that is due to your partial contribution from your referral and your inspiration. Thank you so much! I wish you well. Last night I wrote back to this student that I will always treasure the Thank You note that she sent me and that I know that she will be very successful both personally and professionally. Teaching is not easy but the rewards of connecting with students, mentoring them, and seeing them begin to realize their dreams are some of the best acknowledgments that a professor can ever receive.